Approximate locations of the three reported robberies. 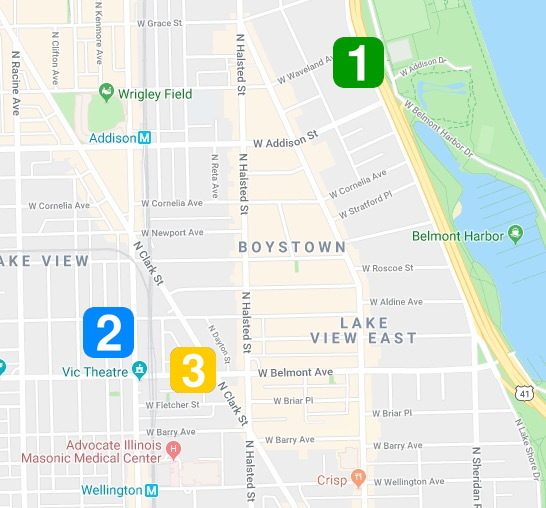 While robbery reports in Wrigleyville and Boystown this year remain near historic lows, there are indications that things are thawing out for summer. Three robberies have been reported in the neighborhood since Saturday. Most recently, a man was robbed by two offenders in the 3600 block of North Lake Shore Drive around 10:30 p.m. Monday. The man said the robbers emerged from a dark minivan, implied that they had a weapon, and took his phone. He said the offenders were both Hispanic and one of them had a thin mustache and goatee. Around 9:30 p.m. on Sunday, a Lakeview man reported that two offenders tried to rob him at gunpoint in the 3200 block of North Kenmore. The victim managed to escape without losing any property to the pair. He said the offenders were both black, between 18- and 20-years-old, and one was wearing a blue hoodie. They were last seen heading northbound on Kenmore. Around 1:40 a.m. on Saturday, a 35-year-old man reported that he was walking out of the Annoyance Theater, 851 West Belmont, when a 28-year-old man began punching him in the face repeatedly, according to police. The offender then grabbed some of the victim’s property and tried to run away, but he was caught and held for police. He has been charged with misdemeanor counts of theft and battery. CWBChicago will be filing an update on this case when court records become available. Note: For statistical purposes, CWBChicago considers police beats 1923, 1924, and 1925 to be "Wrigleyville and Boystown." The boundaries are Irving Park, Belmont, Southport, and Lake Michigan.